Our fashion blog asks: Are you looking for frames that have you covered when it comes to looking stylish and fresh? Cover Girl glasses promise to put a little bit of pep in your daily look. This brand defines what it means to wear cute glasses that turn heads and make you seem devastatingly irresistible. If you’re looking for prescription glasses that go perfectly with everything from blue jeans to formal dresses, you’ll love the glowing look of Cover Girl glasses. Are you dreaming of being a cover girl every time you slip your glasses on before leaving the house? You’re about to discover that creating a cover-ready look is as simple as finding the perfect Cover Girl glasses for your features. Cover Girl launched in 1961 as a makeup brand that offered clean products and lovely colors. It soon became the favorite brand of young women across the country. In fact, Cover Girl is a brand that’s synonymous with fresh-faced beauty and radiance. Many of the top models, television personalities and music stars of the past five decades have been featured in advertisements for Cover Girl. The brand expanded in recent years with the addition of a line of accessories. One of the most popular branches of the Cover Girl accessories family is its eyewear line. 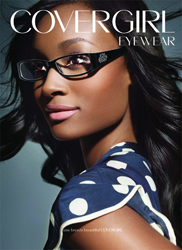 Cover Girl glasses are popular because fresh, perky eyewear looks will always be popular. It’s so easy to become addicted to the flirty, fashionable looks that the Cover Girl label offers. Of course, there are plenty of designs sprinkled throughout the current collection that can help you pull off a studious, serious look that is sure to get you noticed in professional situations. It is so easy to fall in love with this label because there is just something about its designs that will make you feel like you’re a teenager again. Cover Girl is a brand that’s undeniably youthful. It’s almost as if the designers behind the label have a secret fountain of youth that allows them to create gorgeous designs that make everybody feel radiant. 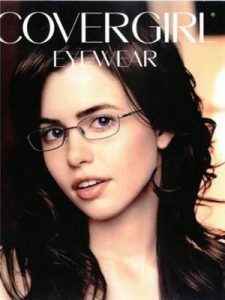 It’s quite obvious that young women are crazy about Cover Girl frames. The label is a common sight in high schools and on college campuses. Of course, you’ll also see plenty of Cover Girl frames if you look out into the audience of a music concert on any given Friday night. It’s important to understand that the Cover Girl brand doesn’t just produce cute hipster glasses that younger shoppers gravitate toward. What many older women are surprised to discover is that Cover Girl also provides many designs that are perfect for them. Many women are pleasantly surprised to stumble upon practical and sophisticated designs from the label when they are searching for prescription glasses online. There’s nothing like a pair of cute glasses to put some spring in your step after years of wearing boxy, boring frames. Cover Girl frames have been spotted on some of Hollywood’s fiercest starlets. The classic Cover Girl look is so compatible with the fresh vibe that today’s hottest actresses, singers and personalities are all about. Stars like Michelle Trachtenberg, Miley Cyrus and Avril Lavigne have all been caught covering their famous eyes in frames that embody the Cover Girl look. There’s definitely a good chance that every up-and-coming star you see on the red carpet or in candid shots will be photographed in Cover Girls frames and shades. Cover Girl earned a worldwide reputation for helping women feel beautiful by offering makeup with magnificent textures and brilliant colors. The brand has been able to take that same magic formula and translate it to the world of eyewear. What makes Cover Girl designs so lovely? The brand puts the fun back in choosing both understated frames and bold hipster glasses. You’re likely going to be surprised when you discover just how much versatility the brand offers. One of the things Cover Girl does best is to design petite frames that are feminine and subtle. There are many square and rectangular styles of wispy frames with little sparks of color to choose from. The brand’s designers are experts at playing with lines and textures when offering everything from rimless designs to thick, attention-grabbing frames. Cover Girl is a brand that knows how to pull off the cat-eye frame like nobody else around. You can choose from a number of gorgeous cat-eye looks that will instantly make you look sassy with a smart twist. What’s really fun is the way Cover Girl is not afraid to play with colors like many posh designer brands are today. You’ll find plenty of pink hues and multicolored designs when you dig in and search for frames to call your own. Cover Girl isn’t a brand that’s all about style without providing any substance. In fact, you’ll find that your Cover Girl frames are extremely comfortable and lightweight. Fans of the brand are quite impressed to discover that designs so fun and youthful can be so comfortable and durable. Share with us and our thousands of readers in the comment sections below of your favorite Cover Girl glasses and tell us the story of how you found them and what inspired you! This entry was posted in Cover Girl Glasses and tagged cool glasses, Cover Girl Glasses, cute glasses, designer glasses, fashion blog, Glasses, Prescription Glasses Online. Bookmark the permalink.